Margaret Leech, Reveille in Washington. Church spires dominated the skyline of the city of Washington at the time of the Civil War, symbolizing the importance of houses of worship in the religious, social and political life of the nation’s capital. 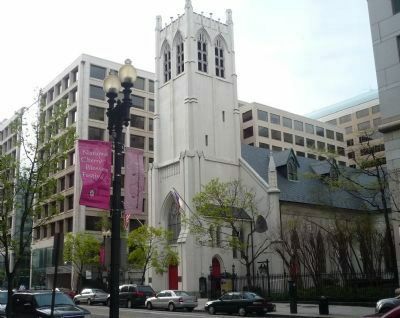 While Washington still claims an extraordinary number of historic downtown churches, the Church of the Epiphany is the only original pre-Civil War downtown church building to survive. Its walls were witness to the suffering of the wounded soldiers for whom it was a temporary hospital. Here, as in other churches, planks were laid on top of the pews to make a platform for the beds. 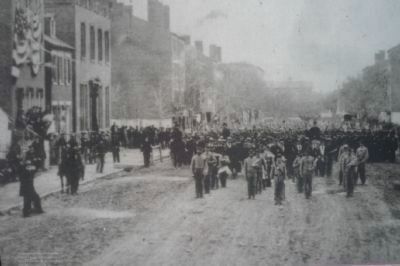 "Returning Union soldiers assemble on a dusty F Street in 1865, preparing for a grand march down Pennsylvania Avenue. (Library of Congress.)" family and friends in the South, and brothers and sisters and husbands and wives and wives often held conflicting loyalties. Even First Lady Mary Todd Lincoln had three brothers fighting for the Confederacy. Northerners accused the city of being “Secesh,” short for secessionist. 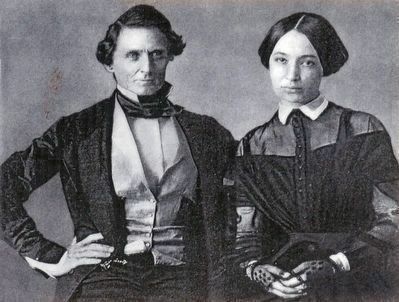 At one time, Senator Jefferson Davis, who became the president of the Confederacy, lived nearby and was an Epiphany member. 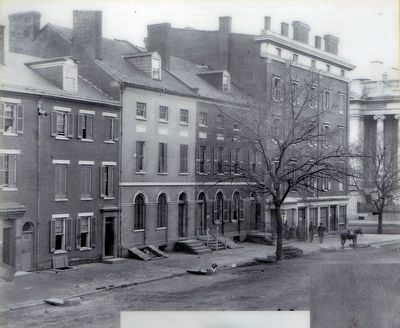 Senator Judah P. Benjamin, later Davis’s attorney general, and Senator Robert Toombs, who became Davis’s secretary of state, lived on then-fashionable F Street one block over from the church. The Reverend Charles Hall, Epiphany’s rector, balanced his Southern sympathies with loyalty to the Union. 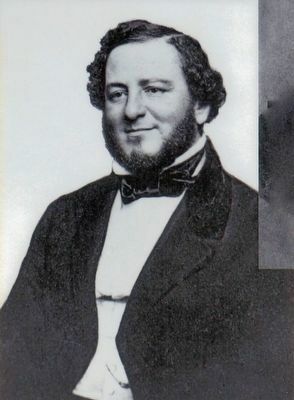 He was so persuasive about his loyalty in a meeting with Secretary of War Edwin M. Stanton that the latter began to attend worship services at Epiphany on a regular basis, using the former pew of Jefferson Davis. With Stanton as an example, many Union generals, too, began to attend Epiphany. President Lincoln himself came here for the funeral of General Frederick Lander of the Army of the Army of the Potomac. Location. 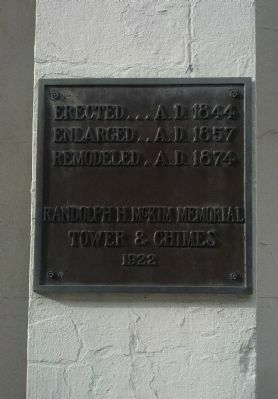 38° 53.905′ N, 77° 1.822′ W. Marker is in Penn Quarter, District of Columbia, in Washington. Marker is on G Street Northwest west of 13th Street Northwest, on the right when traveling west. Touch for map. Marker is at or near this postal address: 1317 G Street Northwest, Washington DC 20005, United States of America. Touch for directions. visible at sidewalk, to the right of main entrance. (a few steps from this marker); W.E.B. DuBois 1868 - 1963 & Mary White Ovington 1865-1951 (within shouting distance of this marker); Luther and Charlotte Gulick (within shouting distance of this marker); Discover DC / Metro Center (within shouting distance of this marker); Harriet Tubman circa 1820 - 1913 (about 300 feet away, measured in a direct line). 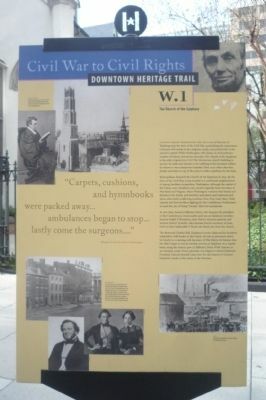 Touch for a list and map of all markers in Penn Quarter. More. Search the internet for The Church of the Epiphany. Credits. This page was last revised on April 9, 2019. This page originally submitted on April 9, 2010, by Richard E. Miller of Oxon Hill, Maryland. This page has been viewed 1,150 times since then and 15 times this year. Last updated on April 7, 2019, by Bruce Guthrie of Silver Spring, Maryland. Photos: 1, 2, 3, 4. submitted on April 9, 2010, by Richard E. Miller of Oxon Hill, Maryland. 5, 6, 7. submitted on January 7, 2016, by Allen C. Browne of Silver Spring, Maryland. • Andrew Ruppenstein was the editor who published this page.